The meeting's first press conference on Monday, themed "Solar Explosions in Fine Detail," featured images and videos from the 1.6-meter New Solar Telescope. Alexander G. Kosovichev (Big Bear Solar Observatory) presented new results on the photospheric and chromospheric dynamics of sunspots. Santiago Vargas Dominguez (BBSO) showed images of transient small-scale magnetic flux emergence and solar atmospheric response. Haimin Wang (New Jersey Institute of Technology) presented results from a study of two successive three-ribbon flares. Finally, Thomas Berger (National Solar Observatory/AURA) offered a status report on the 4-meter Daniel K. Inouye Solar Telescope now under construction on Haleakala in Hawaii. 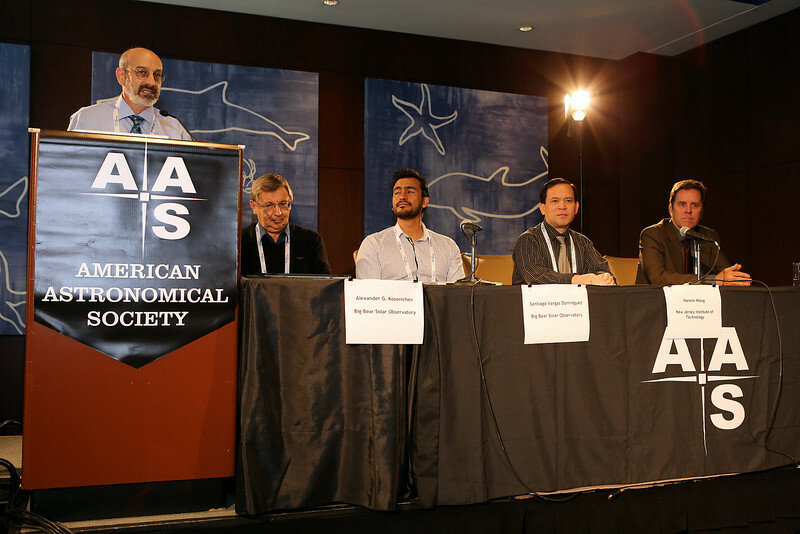 AAS Solar Physics Division (SPD) Press Officer Craig DeForest (Southwest Research Institute) helped AAS Press Officer Rick Fienberg organize this briefing, one of two to feature work done by AAS/SPD members.